Fresh gunfire and explosions have been heard at Westgate shopping centre in Nairobi where militants are said to be holding a number of hostages. Sixty-eight people have been killed and more than 170 injured since the attack began in Kenya’s capital on Saturday. 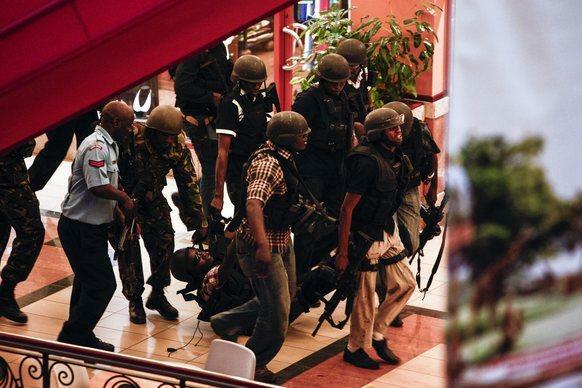 Between 10 and 15 attackers – thought to be militants from the Somali al-Shabab movement – are still inside the Westgate shopping centre. Reporters at the scene said there had been heavy and rapid bursts of fire. The International Criminal Court (ICC) announced on Monday morning it was adjourning the trial of Kenya’s Deputy President William Ruto on charges relating to violence following elections in 2007. The court said William Ruto would be excused for a week to return to Nairobi to help deal with the crisis. The battle to end the long stand-off is continuing in earnest as conditions for those trapped inside the complex deteriorate. An unnamed Kenyan security source told the AFP news agency that an army assault was underway. An AFP correspondent at the scene said he heard about 15 minutes of fierce gunfire which then subsided. A photographer accompanying the correspondent said troops deployed around the mall were forced to duck for cover. The photographer said it “sounded as if the shots were coming from somewhere around the mall, or were being fired from a vantage point in the mall”. Authorities have emphasised that it is a delicate operation as the safe rescue of the hostages is their top priority, says our correspondent. Four soldiers had been injured in the attack by Sunday evening. Kenyan military vehicles have been seen entering and leaving the area throughout Monday morning. A Kenyan security official said that their forces were receiving foreign assistance, namely from Americans and Israelis. Overnight reports said that the gunmen were holed up in a supermarket. Earlier, defense spokesman Col. Cyrus Oguna said only a small number of hostages were still being held and most had been rescued. As troops continued to clear the building, it was possible they would come across more bodies, Col Oguna warned on Sunday. In a news conference on Sunday, Kenyan President Uhuru Kenyatta said the country was united and strong in adversity. “The criminals are now located in one place within the building,” he said. Uhuru Kenyatta said his nephew and the man’s fiancée were among the dead. President Barack Obama called President Uhuru Kenyatta on Sunday to express condolences and reiterate “US support for Kenya’s efforts to bring the perpetrators of the attack to justice”. The wife of an American working for the US Agency for International Development was killed, US officials said. Prominent Ghanaian poet Kofi Awoonor – who was attending a literary festival in Nairobi – also died, as did a Chinese woman. French, Dutch, South African, Indian and Canadian nationals are also among the foreigners confirmed killed, along with a dual Australian-British national. Thousands of Kenyans responded on Sunday to appeals for blood donations. Al-Shabab says it carried out the attack in response to Kenyan military operations in Somalia. The group, which is part of the al-Qaeda network, has repeatedly threatened attacks on Kenyan soil if Nairobi did not pull its troops out of Somalia.